Catalog Page 36A. 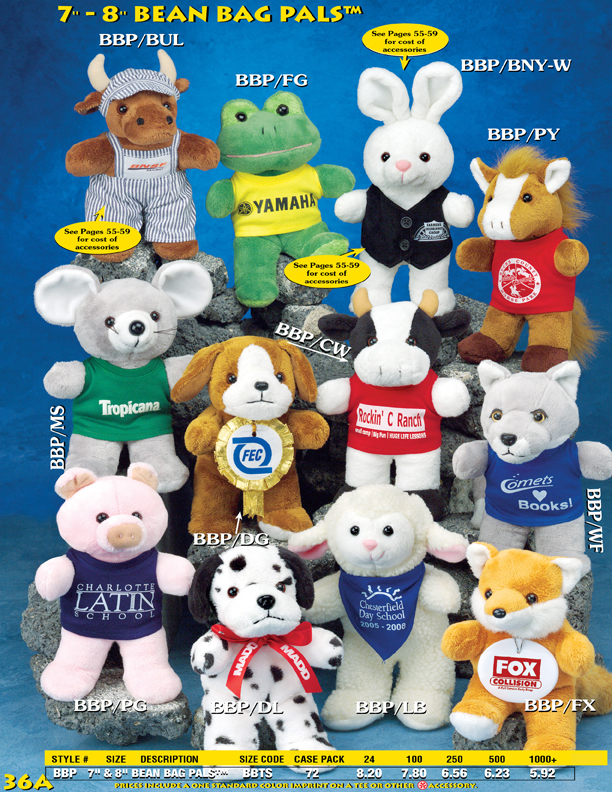 7" promotional beanie animals. 8" customized beanie animals. Order personalized beanie animals with your logo printed onto the front of each shirt. Our beanie animals include a Dalmatian, lamb, fox, pig, wolf, cow, mouse horse, frog, rabbit and a bull. All prices include a one-color printed t-shirt. Our standard imprint colors are red, white, black and blue. As you can see, we have a large selection of farm animals, dogs, cats, mice, pigs, Dalmations, zebras, Koala bears, bees, black cats, horses, donkeys, lions, penguins, polar bears, cow, lamb and sheep, ponies, rabbits, moose, pandas and other farm animals. Custom moose are very popular for our Canadian customers.